Excerpts from DiMaggio’s Autobiography, "Lucky to Be a Yankee"
DiMaggio was a man of few words. That’s why his autobiography, "Lucky to Be a Yankee," first published while he still was playing, was a treat for his fans. 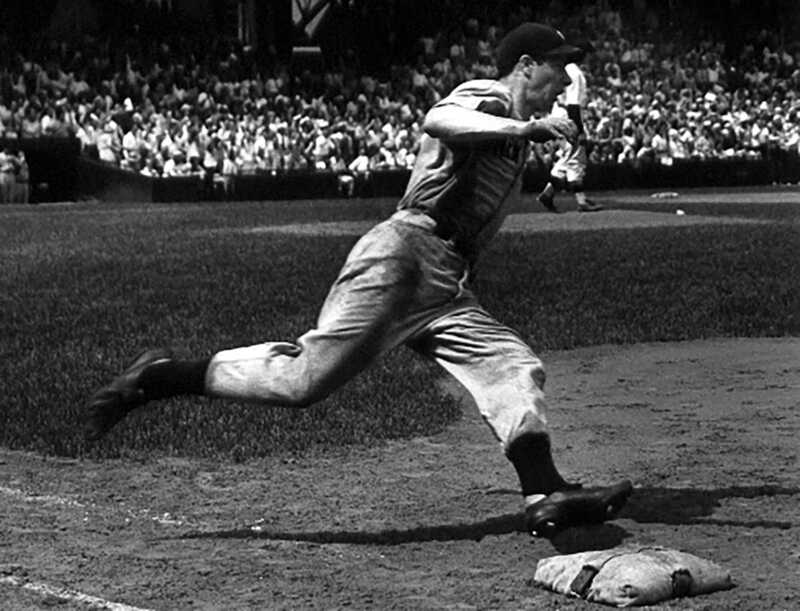 Although DiMaggio only talks about baseball, the book is packed with insights about his career, his fellow ballplayers and the national pastime that he played so gracefully. Here are a few excerpts. 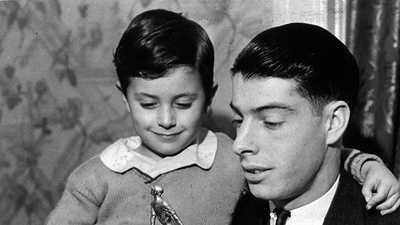 During one of his contract disputes, DiMaggio told management that if he didn’t play baseball he could always go back to fishing. It was an idle threat. As DiMaggio makes clear in this passage, he never was drawn to the fisherman’s life of his father. Baseball didn’t have much appeal to me as a kid, but it was far better than helping Pop when he was fishing, or helping clean the boat. I was always giving him excuses, principally that I had a weak stomach, but he insisted I was merely lazy. And, to tell the truth, I don’t know which he thought was the greater disgrace to the family, that a DiMaggio should be lazy or that a DiMaggio should have a weak stomach. DiMaggio’s advice that a ballplayer relax is quite unexpected from the player many of his teammates considered as tense as any. The first requisite of the good hitter is confidence. No player can be a hitter without it. Relax — be yourself up at that plate. Such advice had been handed down to me by fellows who knew what they were talking about—Cobb, Lefty O’Doul, Cronin, Ruth. If there is fear in your heart that you might not hit or that the pitcher might hit you, you might as well give up baseball. There are lots of pitchers who will deliberately aim one close to your body to scare you away from the plate. That’s all part of the game. Yankee first baseman Lou Gehrig had just emerged from Ruth’s shadow when the young DiMaggio arrived in New York in 1936. Two more sensitive egos might have clashed, but that was not to be. Gehrig was the type of ball player to command respect, even if you weren’t his teammate. To see his broad back and muscular arms as he spread himself at the plate was to give the impression of power as no other ball player I ever saw gave it. I not only admired Lou but I was amazed by him. I had read, of course, how he had gone along for seasons in the shadow of Babe Ruth, but Ruth wasn’t with the Yankees when I first joined the club. I thought all eyes would be on Gehrig but found instead that the spotlight was on me, a rookie from the Coast. Gehrig had played eight years without missing a ball game for the Yankees before I ever played professionally. The fact that he was being taken for granted didn’t bother Gehrig a bit. He was courteous, gracious and informative whenever the writers asked him anything, but he didn’t mind being left to himself. 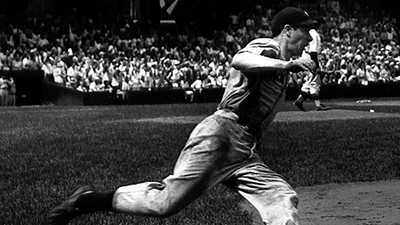 DiMaggio is considered one of the greatest center fielders to ever grace Yankee Stadium’s center field. Here he talks about the right temperament needed to play his position well. The prime requisite of an outfielder, taking for granted that he can hit, is temperament. A fellow must be patient and be able to stand and wait for a ball to come to him. Some outfielders, with too much nervous energy, drive themselves half crazy during a game when they get no chances, and wind up talking to themselves. I have known quite a few that couldn’t stand the peace and comparative quiet of outfield life. Center field may look like a lonely place, but the fans are often within earshot. Whether at home or in an opponent’s park, DiMaggio heard plenty of praise and criticism from the bleacher seats. Here, he responds. Fans will always try to talk to you. . . They’ll ask you questions out loud and if you ignore them completely they’ll call you stuck-up and swell-headed. If you make a bad play, they’ll call you names and if you make a good play, they might even call you lucky. That’s all part of the game and if you let the fans, who pay your way in baseball, get your goat, you might as well give up outfielding altogether. At the end of the 1949 season, the Yankees held a special day to honor Joe DiMaggio. 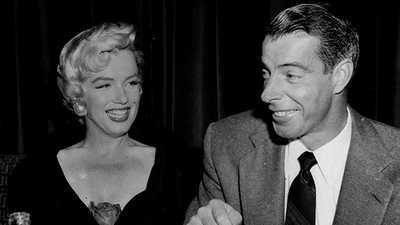 DiMaggio, often portrayed as a cold and distant man, speaks here of being overcome with emotion. I had young Joe at my side while the ceremonies were going on and I started to shake all over, partly from the cold weather, but mostly from the emotion which was surging within me over this wonderful demonstration the New York fans had arranged on my behalf. They asked me to say a few words. I don’t know how they ever came out, so choked up was I. Here I was — an immigrant fisherman’s son standing in front of 70,000 people, and alongside the Mayor of the world’s greatest city. It was overwhelming, and I believe, in closing my speech, I said, ‘Thank the Good Lord for making me a Yankee.’ I’ve never been more serious in all my life. Authorities at Monroe’s house didn’t know what to do or who to call, as Monroe had no family. So they called DiMaggio.